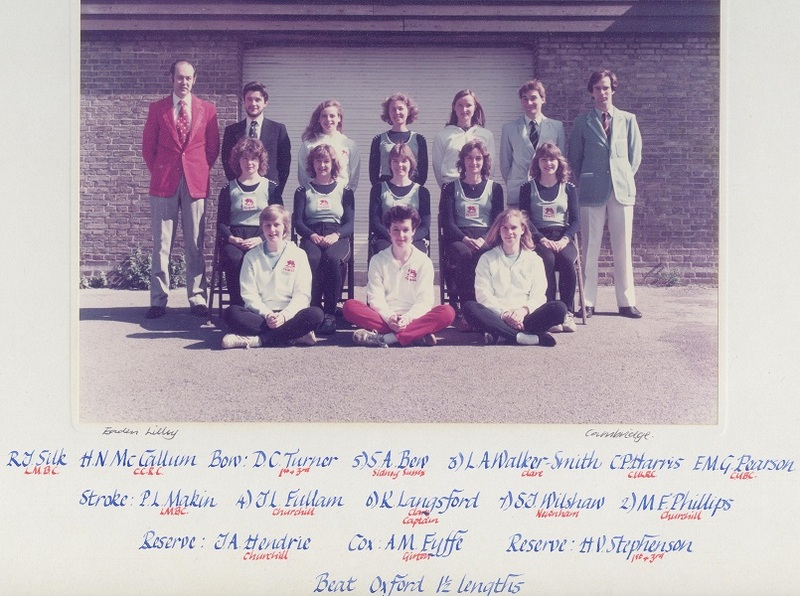 When we stood outside Ryder & Amies on a cold December morning in 1983 to see if our name had appeared on the list for the first ever Cambridge Women’s Lightweight crew, we probably weren’t thinking much about the historic significance of that boat, just whether or not we were in it. But that Cambridge Lightweight crew was part of a bigger moment in women’s sporting history, reflecting not only the fact that Great Britain had yet to formalise women’s lightweight rowing, but more generally, the increasing recognition for women in sports nationally and at Cambridge. I have heard you are wondering why we started a lightweight race. Well the real answer is simple – in the Blues selection process there were always a large number of outstanding athletes who were technically better rowers and always faster runners who nevertheless did not get selected for the Blue Boat. There was an obvious need given the average size of British women for a new lightweight category to allow these women to compete on a level playing field and express themselves as athletes in their own right. One of the important factors was the decision to raise the weight restriction. The Amateur Rowing Association almanac from 1983 stated that “A women’s lightweight is one who does not exceed 55 kg”, but ‘this was essentially a category for coxswains and very few races were organized’, Nonie explains. It was by chance that she had as her chief supporting coach and selectioner the Australian oarswoman, Rachel Webster. In Australia, where women’s lightweights were well established, the weight limit was 64 kg, so Webster suggested raising the limit. Because the Varsity races were ‘private races’, Cambridge was not obliged to follow the ARA rules. In the summer of 1983, Oxford was challenged to a lightweight race with a 64kg maximum weight and accepted. 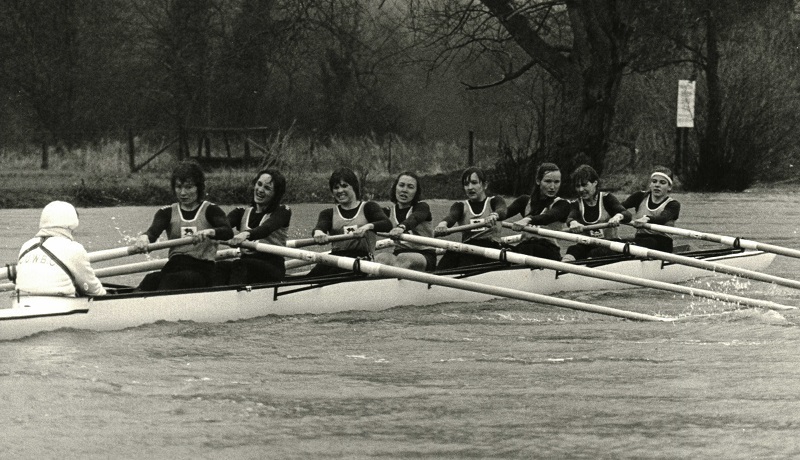 At the start of the Michaelmas Term in 1983 Kath Pocock (née Langsford) was asked by Nonie if she would like to help set up the first CUWBC Lightweight crew to race against Oxford. The new weight category had been approved, though was ultimately fixed at an individual weight limit of below 59kg (in the end, our crew averaged 57kg), and the two universities had the the full support of the ARA for the race. 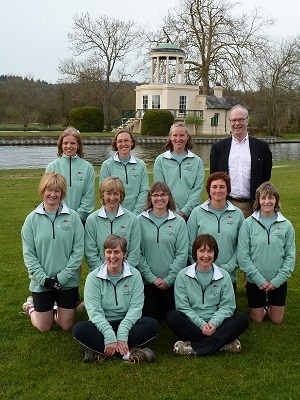 CUWBC then had to set about getting sponsors, raising funds and finding coaches. Nonie writes, ‘We charmed some of the best men’s coaches to come and try coaching a women’s university boat by setting up a schedule of weekly slots which would not take too much of their time. All the coaches were impressed by the dedication and responsiveness of the crews – and – who knows why, “pleasantly surprised”! We also appreciated the higher standard of coaching’. During the Lent term the crew continued to row with their colleges and only rowed together, on the Cam, twice a week. As part of crew bonding, we also had a tea party each Wednesday afternoon in the basement kitchen of Steve’s (Stephanie Bew’s) house, and though legend has it that these included delicious sticky buns from Fitzbillies, plus walnut cake and crumpets from Sainsbury’s, some of us are cross that we can’t remember them in all their sumptuous detail! The crew borrowed a white plastic boat from New Hall, which suffered damage to its bow in the Lent Bumps and had to be hastily mended. However, we did have our own Macon style blades, and very special blades they were too! After writing to numerous companies to seek sponsorship, we were lucky enough to secure £1,000 from British Sugar to buy a set of blades. The stipulation of the deal was that the Silver Spoon logo was to be painted on to the spoon of the blades. We were the first crew in the UK to have our sponsor’s logo on our equipment as the ARA had just voted to allow this. Two representatives from British Sugar came to Cambridge to discuss the deal with Kath and Louise. Kath remembers offering them sugar for their tea, but they had it without! British Sugar also provided Silver Spoon t-shirts for use in training. Four excellent coaches, Hamish McCallum (Clare), Roger Silk (LMBC), Chis Harris (Trinity Hall and CULRC) and Ewan Pearson (Jesus and CUBC), each coached for two weeks, and their complementary coaching methods developed a fine racing crew. Sarah remembers our coach Hamish cycling on the towpath booming, ‘long and strong, ladies, long and strong’, at us. Nonie reminded us in her letter that rivalry between Blondie and the Lightweights was high: ‘even in the Blue boat we feared being embarrassed by the Lightweights, especially if we were racing with a tail wind’. By the Women’s Head of the River, she recalls, ‘all three boats finished in the top 12 women’s crews with Blondie just 4 seconds ahead of the Lightweights’. The training regime has prompted some less pleasant memories. Here’s Sarah’s: ‘I remember the odd five mile run, mostly because I couldn’t understand how rowing fitness translated so poorly to running fitness! No idea which coach made us do it. I will say that the warm-ups we used to do, both in Lightweights and Club crews, would these days constitute a reasonably complete workout? Burpees, anyone? Yuck’. Jane Fullam recalls, ‘Didn’t we also do ergo sessions at one of the college clubs houses? I also have strong memories of doing some hateful running’. The weekly sessions at Fenners were also pretty unpopular, only made up for by the apocryphal teas. After the Lent Bumps, where the crew members competed against each other, we moved to our training camp in Henley. In between outings, we found other ways to relax while keeping focused on the main event. Jane wonders, ‘Did we walk up the church tower at Henley to look at the course beforehand?’ Photographs taken from a height over Leander suggest that we did, though most of us can’t remember that! Evenings were spent watching ‘inspirational’ videos. Louise remembers ‘someone saying that some of us would be motivated by Flashdance and some by Chariots of Fire. At the time I think I was a Flashdance girl!’ As part of our warm ups we stretched to ‘Relax’ by Frankie Goes to Hollywood, viewed somewhat askance by our coach Ewan Pearson who’d also kept a careful eye on our diet during those days so that no-one topped the scales. Nevertheless, Sarah remembers that on the evening before the race, Ewan asked our landlady if she would cook a carb-loading supper for us. ‘We had spaghetti bolognese and chocolate pudding with chocolate sauce’. Mary admits, ‘The only memories I have of the race are those of excruciating pain. A combination of the horribly freezing rain (I know I couldn’t feel my hands for any of the race and don’t know how I held on) and the broken rib/strained inter-costal that I was nursing!!’. Lynelle agrees: ‘I do have one vivid memory during the race of extreme pain - I think it must have been when we went for a big push - were Oxford coming back at us?’ From bow Mary and Deanna could see Oxford gaining on us, and at one point it really looked as if they would win. But Ali and Louise did make us push, we finally found our stride after the turbulence and uncertainty of the start, and, at the end of a close race, we crossed the finishing line first. A photo shows the champagne celebration back at the boathouse, and Lynelle remembers that ‘someone had made us a ‘victory’ cake - who had enough faith in us to get that ready!’. In the evening there was a dinner with the Blue Boat, Blondie, coaches and guests at Leander. Boosted by victory, many took up the invitation from the National Squad to train with and compete against the first Great Britain Women’s Lightweight Eight at the International Ghent Regatta, as the Squad did not yet have enough lightweight rowers to form a second team. Summoned up to the London Docks for training and selection (‘I remember sleeping on someone’s floor and a very grey, unpleasant row’, writes Lynelle), we were rewarded with a GB t-shirt to wear for the event. We were in the right place at the right time, but we’d also earned our stripes. Cambridge women continued to make women’s sporting history when four of the winning Cambridge Lightweight crew (Louise Makin, Stephanie Bew, Jane Fullam and Mary Phillips) formed a lightweight coxless IV that won a silver medal at the National Championships, and then went on to be selected to represent GB at Montreal – the first World Championships to include lightweight women’s events. As Nonie Ray puts it, women’s international rowing had come of age, and lightweights were here to stay. Fast forward thirty years and Kath found herself once again forming a Lightweight crew, the very same crew as in 1984, although not quite as light! 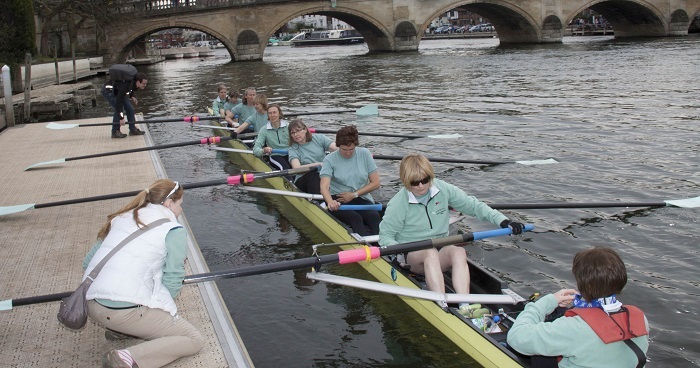 As part of the celebrations to mark the 30th anniversary of the first Oxford and Cambridge Lightweight Women’s boat races, a row-past of the original crews was to be held at the 2014 Henley Boat Races. In the age of emails and Facebook it was possible to locate the crew members and co-ordinate the reunion, even with crew members now living in New York and New Zealand as well as different parts of the UK. Kath, Louise and Steve had met recently at the Iris dinner, and Steve, who is still a committed oarswoman, commented to us all, ‘there were so many details I had forgotten about our lightweight year – it was lovely to talk about our experiences and look at some of the photos. It really doesn’t feel like thirty years ago’. That was to prove true for all once we met up again. In the months that followed, crew bonding continued over the internet, including learning about who else among us had kept up with the sport. Some knew of Louise’s early sculling ventures, while Sarah informed us that she had taken up sculling six years before on Lake Pupuke, New Zealand. For most of us, though, it had been close to three decades since we’d wielded a proper blade (though Kath sensibly sought out a four in Goring), and with the opportunity for only one practice in Henley the day before the row-past, a few of us were just a little apprehensive. On top of that, we were quite concerned about the state of the river, after all the flooding of the previous months. We’d had regular updates from Ali, and finally, with three weeks to go, she was able to write, ‘Just looked on the river level website and finally a green flag!!! Hopefully it shouldn’t take too long for that to work its way down to Henley. Let’s hope the rain forecast over the weekend doesn’t amount to much …’. Our hopes came true. The races were confirmed for Henley, and the one-day training camp took place on a sun-drenched Thames: an outing in a boat hired from Henley Rowing Club, and a pub lunch where we caught up on thirty years of news. On the following day, ‘Race Day’, we rowed in a boat owned by CUWBC with cleaver blades. Our coaches Roger Silk and Ewan Pearson attended as spectators and we were supported by husbands, partners, children, friends and relatives, some of whom had watched the race in 1984. Many of us were able to attend the CUWBC Anniversary Brunch, and it was a thrill for us to hear from former CUWBC Head Coach, Roger Silk, the current Chair of CUWBC, Cath Bishop, and the Olympic Gold Medal Winner, Anna Watkins. The 1984 ‘original’ Lightweights were asked to stand, and the gathering was particularly impressed when they learned of Mary’s and Sarah’s incredible efforts in coming from New York and New Zealand. When Cath Bishop announced that Oxford had managed only one crew member from 1984, while we had a full boat, plus Cox and Reserve, there was a resounding cheer and applause. Cambridge could definitely claim the moral victory. After brunch, Sarah Harbour, the CUWBC Administrator and Lightweight alumnus herself, liaised closely with Kath over the final preparations for getting us in a boat. We walked along the tow-path, bumping into old friends along the way, to watch the current crews race each other – ‘Amazing to see how they do things now compared to thirty years ago, and the weather made a big difference!’, wrote Jane Pardoe afterwards, and indeed we were all very impressed with the advances in both equipment and kit that we saw. Some of us had brought along our original scarves, though in the end it was almost too warm to wear them, for it was another beautiful sunny day. But we had our new Cambridge blue t-shirts to wear, made of the same fabric as thirty years earlier, emblazoned with ‘CUWBC 1984 ORIGINALS’ on the back. Over this we wore a Cambridge blue fleece in the same style as the current CUWBC Lightweights – this was our chance finally to have a proper up-to-date piece of kit! Then the real work started for us, and possibly the most nerve-wracking part of the event – would we be able to lift the boat? Kath, our captain, gathered us around for a pep-talk. We were going to enjoy this experience, and how amazing it was that we could all be there on that day, and that all of us were fit and healthy enough to do it. In that moment of reflection, which inevitably summoned up the thirty years that had passed, probably every one of us had different thoughts going through our head, but we were all united in feeling how lucky we had been as a crew – lucky to have had such a captain in Kath, to have been part of such a team, and to have been given the chance to return to that very spot to row together again. Once the boat was in the water, we took our seats, slipped into our shoes, and were pushed away from the platform just as we had been all those years ago. The feeling of taking that first stroke as a crew was unbelievable. It’s a feeling we’ll never forget, and it lasted all the way down to Temple Island and back to Leander. Partly it was the pleasure simply of being together on the water again after all those years, but there was something more, too. The timing, the balance, the poise were all there, ‘gliding along rock solid at easy oar’, as Sarah puts it. It was a reminder from somewhere deep in ourselves, resurfacing through all the other half-forgotten memories, of something we had once known how to do, and do well. An approving voice came from the bank after the practice row: ‘Form is temporary, class is eternal’. Mary said afterward (and Louise and others agreed), ‘as long as I stayed relaxed, muscle memory did the job, even after thirty years, but if I tried to apply brain it all went to pot … so I relaxed!’ There might have been a few clenched teeth at points as Ali peppered the what had always been touted as a gentle ‘row-past’ with regular bursts of firm, but onlookers from the tow-path later remarked to us that we all had smiles on our faces. Those didn’t wear off for days afterwards, as a flurry of emails confirmed what for all of us had been a ‘brilliant day’. Following the 2014 row-past, a few of the crew have been inspired to take up rowing again – on Long Island, New York, and more locally on the Thames at Goring – while Sarah is going to carry on sculling on Lake Pupuke. Whether or not others of us seek out further rowing opportunities, March 30, 2014 was a day we’ll never forget. We’re very grateful to CUWBC for inviting us to the anniversary event and for allowing us to feel some pride in having played our part in the club’s, and in sporting history.